How often are you going to run into someone with whom you can do something creative or interesting? Who was right, Jane Jacobs or Alfred Marshall and Michael Porter? 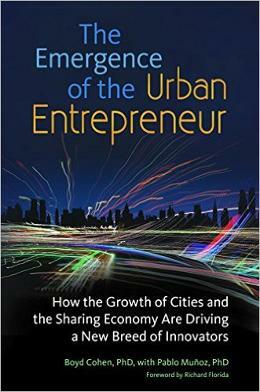 The renowened urbanist, Jacobs argued for decades of the importance of density and diversity of economic actors in cities as a primary driver of innovation. Economists Marshall and Porter, on the other hand, have argued that clustering of similar industries in industrial parks and regions is the best way to stimulate innovation, job growth, and economic development. Depending on the time, location, and industry, perhaps they are all right. Increasingly, however, it appears that more innovation and entrepreneurship is happening in the dynamic, diverse urban areas as opposed to suburban tech parks. The term has its origins in physics where it is used to reference the rate of interactions among atoms in a physical system. Last year, I first heard someone reference the idea of fostering more of this “collision density” between the innovators and entrepreneurs. I must admit that I had never heard of it being applied to the entrepreneurial ecosystem before. After some research, it seems it really has yet to be used in any peer-reviewed academic journals about entrepreneurship–but it’s very important to the idea of a thriving, smart city. I suspect this is not a surprise. When artists, designers, technologists, investors, community activitists, engineers, and entrepreneurs mix together, more innovative ideas are likely to emerge than just a group of engineers discussing the potential for blockchain, peer-to-peer models, distributed renewable energy, and so on. I say this despite somewhat agreeing with the Guy Kawasaki’s infamous statement that while engineers add to the valuation of a startup team, MBAs detract from valuation. Richard Florida long ago drew the world’s attention to the importance of attracting creative mobile citizens to startup cities. I would argue that Florida’s formula of “talent, tolerance, and technology” can equal collision density, which may be one of the secret sauces to creating a vibrant urban entrepreneurial ecosystem. City administrators would be wise to pay close attention to this phenomenon in the global competition for urban innovation talent.